The signing of goaltender Ilya Bryzgalov turned the fortunes of the Phoenix Coyotes around, and could finish the season above .500. It was like most mornings in Phoenix -- warm, temperate, comfortable. But there was something a little different in the air back on Nov. 16. Call it a hopeful breeze. Or maybe that should be "Bryz." That's how it felt in the executive offices of the Phoenix Coyotes just before the team's flight to Los Angeles when General Manager Don Maloney and coach Wayne Gretzky checked the waiver wire and a surprise name appeared. "At 10 a.m., we noticed that the Anaheim Ducks had placed Ilya Bryzgalov on waivers," Gretzky told me recently. "Not much was said. Donnie nodded. I nodded. And at 10:01, we put in our claim for him." But Gretzky explained that the Coyotes' brass had to temper its excitement over the possibility of acquiring the 6-foot-3, 208-pound goaltender from Togliatti, Russia, who helped the Ducks win several key games in their Stanley Cup run last spring playing behind J.S. Giguere, because the team was third on the waiver list and had to wait 24 hours to see if Buffalo or Washington also claimed Bryzgalov. "When Donnie talked to Ilya's agent later in the day, we were all optimistic and I remember saying, 'Tell Ilya to get a good night's sleep, because if we get him at 9 a.m. (Pacific standard time), he's starting for us against the Kings at 1 o'clock.' " Gretzky laughed, saying that it felt like the Coyotes had won the lottery when they were given the word that Bryzgalov was their player. "I'll never forget, the first two shots against him were mind-boggling saves. He got a shutout for us -- and he's given us a chance to win every night since." The Coyotes were 7-10 and a perennial afterthought in the Pacific Division before Bryzgalov's 28-save, 1-0 shutout immediately gave Phoenix players the idea that they could be a playoff threat for the first time since 2002. Waiver-wire pickups don't generally make headlines. But this one has. At a time when we are blitzed with lists of the top 10 this or the top 10 that and fans are quick to look for the best and worst of trades, etc., Bryzgalov has made the same kind of impact for the Coyotes that Roberto Luongo did for Vancouver after he was traded from Florida to the Canucks before last season ... only on a slighter smaller scale. In fact, he might be the best goaltender waiver acquisition since 1969 when the Chicago Blackhawks claimed Tony Esposito from Montreal in the waiver draft. Fast forward to March 11, and we find Bryzgalov in goal against his former Ducks teammates. After surrendering two goals in the first 27 minutes, Ilya stopped every shot after that, including all three Anaheim shots in the shootout to give the Coyotes a 3-2 victory. It was Ilya's third straight win against his former team. Today, he is 28-24-5 with a 2.44 goals-against average and .919 save percentage. "It's all about confidence," Coyotes captain Shane Doan said. "It's funny how confidence breeds expectations and how it can change everything from how you think, even the kind of energy you have when you come to the rink. "We knew Bryzzy hadn't been a No. 1 goalie in the NHL before. But we also knew how good he could be, because he was something like 8-1 or 9-1 against us over the years." Bryzgalov became available because the Ducks won a bidding war with a number of teams last summer over Swiss goaltender Jonas Hiller, who is just 25 with loads of potential. Anaheim GM Brian Burke promised Ilya he would find him a new team after Hiller played a few games in the minors. Thus, Ilya became a salary-cap victim in Southern California ... and a diamond in the rough in Phoenix. "We saw him in the playoffs a couple of years ago and he played great," Colorado Avalanche coach Joel Quenneville said of Bryzgalov. "He's a big guy, with the flexibility of Gumby. He covers a lot of net. That's a young team that works hard. They've become a dangerous team since Bryzgalov has joined them and given them a chance to win almost every night." It was clear from the start that Gretzky planned on going from an iffy goaltending combination of Alex Auld and Mikael Tellqvist to Bryzgalov as a workhorse No. 1 guy. "I told Bryz that he's seen enough games on the bench, he's here to be our No. 1 guy," Gretzky said with a big smile. "I told him we want him to be ready to play between 65 and 75 games for us each year just like Marty Brodeur does in New Jersey, Roberto Luongo in Vancouver and J.S. Giguere in Anaheim. "I told him he'd be our meal ticket. I'm not sure he knew what that meant, but once we began to put him in the goal crease every game I think he got the idea and he's been fantastic. He's kept us in every game." Bryzgalov clearly got Gretzky's message. "It's not like I've been given a right to be the No. 1 goalie," he said. "I know from playing in Anaheim that you have to prove that you deserve the job every day in practice, plus in every game. It's easy to lose the right to be No. 1 ... and a lot harder to keep this job. "It's funny, but (legendary Russian goalie) Vladislav Tretiak always taught me that playing hockey should be fun. It beats working in a factory, don't you think? I've always used that philosophy to push me. I play hockey to have fun. I play as hard and as good as you can all the time. Tretiak always said; 'Give 100 percent and you've done your job.' "
Ilya Bryzgalov is 28-24-5 with a 2.44 GAA and .919 save pct. this season for the Coyotes. At 27, Bryzgalov is no youngster. His biggest claim to fame in Anaheim was a wild sense of humor and the fact that in the 2006 playoffs he became the first rookie to record three consecutive shutouts in the playoffs since 1945, when Frank McCool of Toronto blanked Detroit three games in a row. During the 2006 and 2007 postseasons Ilya twice had to step in for Giguere, posting a 9-5 record with a microscopic 1.68 goals-against average. After the shutout streak, Bryzgalov joked, "This is just a game. If I have to go get another job, I'll do that." Bryzgalov has the luxury of being 6-3 with long, flexible legs. But he clearly has long tended goal under the radar. Alain Chaney, the Ducks’ director of amateur scouting, spotted Bryzgalov in 1998 at the World Juniors in Helsinki. Though Ilya was the backup goalie, Chaney remembers seeing how outgoing the big goaltender was. That emotion is something most Russian goalies rarely display, so Chaney sent another member of his scouting staff to Togliatti to watch him play. Bryzgalov was playing so well that he displaced former NHL goalie Vincent Riendeau as the No. 1 goalie for Lada, which is about 1,000 miles southeast of Moscow. This late bloomer had suffered a setback in 1994 when he was hit by a motorcycle while walking across a road. Seizures followed -- and some said his career was in doubt. But Ilya persevered. And in the 2000 World Junior Tournament in Sweden, Bryzgalov posted a .971 save percentage, prompting then-GM Pierre Gauthier to trade Montreal third-, fourth- and fifth-round picks in 2001 for a second-rounder so that they could take the quirky goalie. That same Bryzzy interest could be found in Phoenix, where Maloney and Gretzky had been talking about Ilya for several months actually. "One of my main priorities when I got the job last May was to strengthen the goaltending position right through the organization," Maloney recalled. "I had a number of conversations with Brian Burke, knowing that the Ducks had J.S. 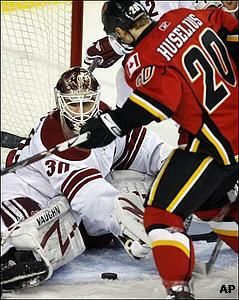 Giguere, had just signed Hiller. We talked at the draft in June and again in training camp. That's when I called everyone I knew to check into Ilya's background. At that point, Anaheim was looking for young assets that we didn't want to part with. I didn't think that giving up young assets for a guy who could be free in the offseason was the way to go for us. Fortunately he came our way in November." And it didn't take Maloney and the Coyotes long to get Bryzgalov locked up in a new three-year, $12.75 million contract. Bottom line: There is clearly no waiver-ing when it comes down to how important Maloney, Gretzky and the Coyotes think Ilya Bryzgalov is to their present and future.